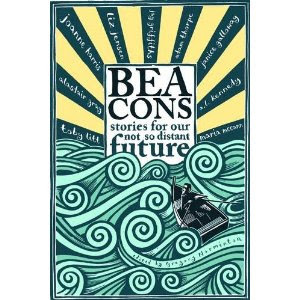 My short essay on how I came to write my story in the forthcoming anthology 'Beacons' is on the One World website here. I've pre-ordered this so for once won't be reading your words years after you wrote them! Good to read the background essay too. I don't travel much at all so should adapt okay if we all have to dig in, but I do worry about what I can contribute to such a community - although perhaps all my reading will mean I can contribute knowledge if not practical skill?!?! This worries me too. It also worries me that there are a lot of people like me - but yes, you're right, I hope. Knowledge is important too. That sounds like a great anthology, and an important story that you wrote. Sad about the retreat of the glaciers. Even in "Glacier National Park" in the US, many of the glaciers have receded. The book arrived this morning - they were pleased to be able to send it earlier than anticipated - let's hope that's not a premonition - I'd be happy if the future was permanently delayed! Excellent, Jem. Thanks for telling me. I've only just managed to get my hands on one myself! Apparently, sales are doing quite well already! Paul: I'm so sorry - I was away from my desk when your comment came in and I completely missed it. But thank you! Very much.